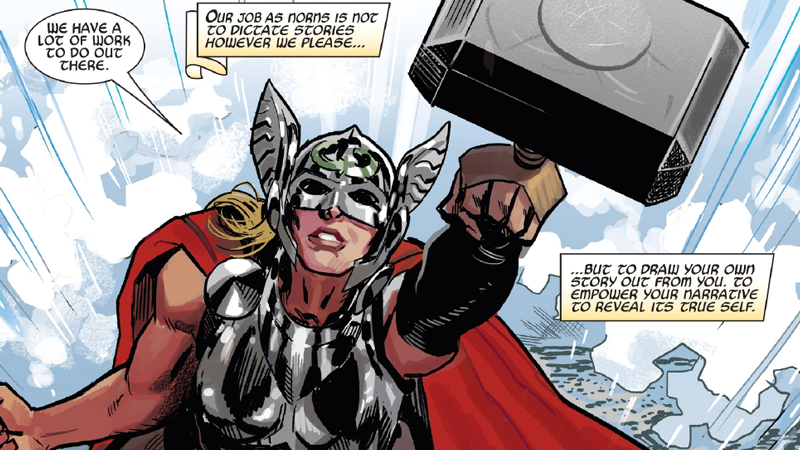 Even before Marvel made it the cornerstone of its new publishing initiative, not many of its comics have tackled the concept of “legacy” as much as The Mighty Thor. So it makes sense that its first issue under the new banner isn’t just about looking to the past, but carving a path for the future of all Thors. Much like the Jason Aaron-penned Legacy special before it, Mighty Thor #700—written by Aaron, with art from Russell Dauterman, Matthew Wilson, and a whole host of guest artists, including Daniel Acuña, James Harren, Becky Cloonan, Olivier Coipel, and many more—is less of an individual story and more of a snapshot into the lives of all the characters that have been swirling around the Thor legacy. There are glimpses into days gone by and other lives throughout the issue: young Odinson struggling to attain the worthiness needed to wield Mjolnir, Loki dealing with his frost giant father’s poor view of him, and even some delightful moments with Throg, the Frog of Thunder. But primarily the issue follows three hammer-wielders in particular: Jane Foster, the Mighty Thor; Odinson, the Unworthy Thor; and Volstagg, the former mayhem-addicted War Thor. Odinson’s tale serves as the overarching frame of the story, as he defends the Nine Realm’s future-seers, the Norns, from an invasion of Malekith’s cross-realm army (which has been part of an ongoing plot in The Mighty Thor for a while now). But while the Norns begin to weave their last glimpses of the future, even as Odinson valiantly tries to protect them, it becomes quite apparent that what Mighty Thor #700 is really about is three distinct reactions to the allure of the mantle of the God of Thunder. At the roots of the world tree Yggdrasill, we have the Odinson, a man yearning to reclaim the mantle for his own once more—just as he did in his youth, by seeking out acts of honor that could restore him to his title. On Earth, we find Jane Foster battling an out-of-control Jen Walters, while she questions if her cancer will let her have the time she needs to be the hero she’s become as the latest Thor, valuing every moment she still has. And then we have Volstagg, to serve as a warning about seeking the power of the Gods. About to be imprisoned after his stint as the new wielder of the Mjolnir from the Ultimate Marvel universe turned him into an out-of-control warrior, Volstagg finds the hammer calling to him once again. Even if it could turn him into mindless maelstrom of fear and rage, he finds himself unable to resist inevitably transforming back into the War Thor for a war that’s yet to come. Three current Thors—one desperate to wield power, one desperate to keep it, and another desperate but unable to run away from it. But what fate do the Norns paint for their futures? Well, it’s hard to say. Karnilla, the Queen of the Norns, expires just as she cuts the strands of fate themselves—and although she dies whispering to the Odinson a message to protect Jane from her fate, the implication seems to be that there is no longer a set destiny ahead for any of them, and instead destiny must be something all Thors must seize for themselves. As Karnilla is about to die, we get a sumptuous vision of what’s to come—a bloodied Thor and fallen Jane is an obvious hint, given this first storyline is literally called “The Death of the Mighty Thor.” We see Loki wielding the Infinity Gauntlet, alongside glimpses of Valkyrie, Namor, and the frost giants. Most intriguingly of all we see the Odinson, holding not just his axe Jarnbjorn, but a new, gold-clad hammer, and a new Thor-esque uniform to match. The Mangog, the legendary Jack Kirby and Stan Lee creation that is meant to be one of the most unstoppable forces in the cosmos. Regardless of whether they want to wield the power of the God of Thunder or not, it’s going to take all three Thors—and perhaps a lot more than that—to stop it from wiping out every God in its path, not just the ones being ominously fated to die like Jane.